Almost two years ago we were sent a Hue Animation Studio to review and the girls had lots of fun with it. We were asked if we would like to review a newer version so of course we said yes. 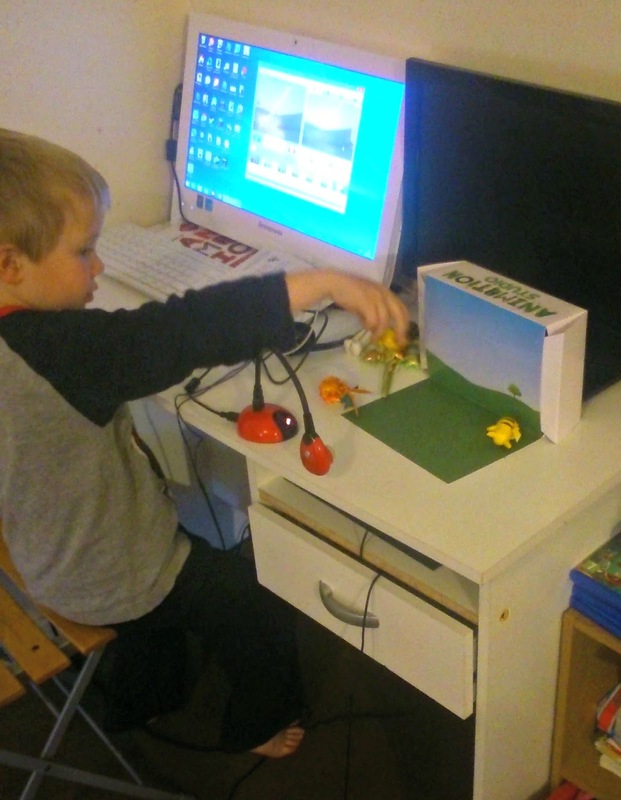 Hue Animation Studio is a stop-motion animation centre which is educational and fun and aimed at children. At first the box looked very similar to the last one. We chose a green camera before, this time we went for red. There were some differences though. Straight away the girls had remembered there had being modelling clay in the pack and were a little disappointed to find that it is no longer included. Modelling clay is the perfect medium for making stop animation characters. It is pretty easy to find and really affordable though…we even found a pack in the cupboard at home so there were soon smiles again. What you do get in the box is a very nice HD camera. When I compared the video quality to the previous animations we had made it was really obvious how much better it was. The camera is plug and play and has a built in microphone. It is very flexible so you can angle it how you want. The camera comes with a base you can plug it into, or you can plug it directly into your computer or laptop. Also in the box is the software CD. The software allows you to edit your films and has many features. You can change the order of the frames, repeat frames, add frames, add sounds or music and loads more. The best feature has to be the onion skin. This will show you a ghost like image of where your items were in the last shot so you can create smoother sequences. It’s also really handy if someone knocks over your camera or your set…which happens when you are working with children! Finally, you get a neat little book with 60 pages of fun ideas for creating movies. We found this really useful for both inspiration and instructions. With our old kit we had not even attempted to use ourselves in our stop-motion animations, but this was one of the suggestions in the book and we had a little try. I’m sure we’ll try lots more too. The box also opens out into a neat little background for you to film against. The editing software is really good. It takes a little while to get used, but even the children managed to do some editing after a little practice. You can even add special effects or texts over your films. I love this little movie from Hue Animations You Tube page which shows some of the effects you can do with the software. Here is a little film that the children made using their Pokemon Toys. They have many more which they are currently in the process of editing and will be added to our You Tube channel when finished. The software supplied make uploading the films to You Tube very easy. Overall we found the Hue Animation Studio great fun. There are so many more things we want to try so I’m sure it’s going to get a lot of use. Age wise, I found that my four year old was able to get the idea of how the animation worked and was able to use the software a little. My seven year old and nine year were left alone after being shown what to do and picked it up quite easily. There attempts were not perfect, but they manage to make the above film all by themselves. They both have started editing their films now. Disclaimer: I was sent the Hue Animation for the purpose of this review, all thoughts and opinions are my own. I have heard of the Hue Animation Studio but didn't really know much about it….It looks fantastic fun.